is a 2003 non-fiction book presented in the style of a novel. 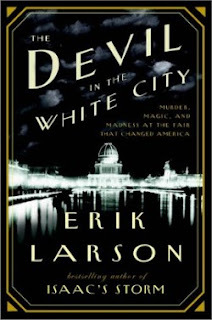 Set in Chicago circa 1893, intertwining the true tales of Daniel H. Burnham, the architect behind the 1893 World's Fair, and Dr. H. H Holmes, the serial killer who lured his victioms to their deaths in his elaborately constructed "Murder Castle." Both men left behind a powerful legacy; one of brilliance and energy, the other of sorrow and darkness.